The collection includes new 802.11ac routers, innovative range extenders, and high-gain antenna upgrades. LAS VEGAS -- Belkin's Linksys division took the wraps off a host of new networking gear at CES on Sunday, including two new Wi-Fi routers, a new NAS box, two new range extenders, antenna upgrades for its existing routers, and--at long last--an open-source Wi-Fi driver for its lauded WRT1900AC router (as part of a new firmware release available here). With a couple of exceptions, all the other new products will be available this spring. The Linksys WRT1200AC is a new dual-band, 802.11ac, 2x2 Wi-Fi router with an integrated four-port gigabit ethernet switch and two removable antennas. Like its bigger sibling, the WRT1900AC, this model will feature a retro industrial design that recalls the famous WRT54G, and it will be outfitted with USB 2.0, USB 3.0, and eSATA ports for sharing a printer and storage on its network. "The new WRT1200AC router enables us to cater to an audience that want all the benefits of a WRT router but at more friendly price point," Linksys VP of product management Mike Chen said in a press release. Linksys says this router will sell for $180. 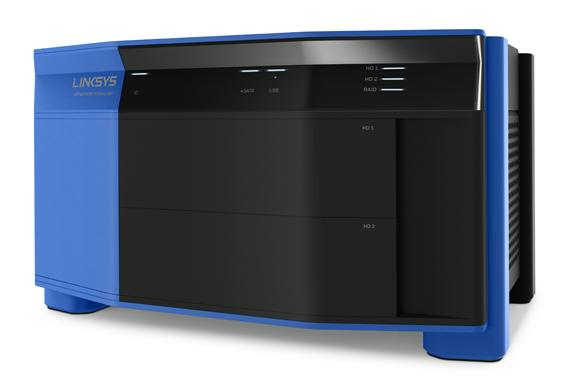 Linksys is also showing a new network storage bay that can be stacked beneath a WRT router or the SE4008 eight-port gigabit switch. The WRT Network Storage Bay can accommodate two SATA hard drives with support for RAID 1 mirroring for automatic redundancy. The enclosure also features one eSATA and one USB 3.0 port so you can connect additional external storage. This product will cost $130. You'll obviously need to provide your own hard drives. The final new product in the WRT line is a four-pack of high-gain, omni-directional antennas (7dBi on the 5GHz band and 3dBi on the 2.4GHz band) that Linksys says should deliver up to a 30-percent increase in coverage. The antenna pack will cost $130. The EA8500 will be Linksys' second MU-MIMO (multiple user-multiple input/multiple output) router following the E8350. The EA8500 is designed to permit multiple users to stream high-resolution video simultaneously, with 802.11ac throughput up to 1733Mbps and 802.11n throughput up to 800Mbps (although you'll likely need a very specific Wi-Fi adapter to reach that speed on the 2.4GHz frequency band). The EA8500 will be outfitted with a four-port gigabit ethernet switch, one USB 2.0 and one USB 3.0 port, plus eSATA. It is slated to cost $280. Every router manufacturer I talk to tells me range extenders are selling like hotcakes--Linksys says its sales in this category have increased 96 percent since June of 2014--so it's no surprise that the company will be offering new models comes this spring. According to Linksys, its RE4100W Wi-Fi range extender can increase the wireless range of an existing router up to 7500 square feet. This N600 model uses one frequency band to receive information and a second to transmit, so it doesn't suffer from any decrease in throughput. It plugs directly into an AC outlet, and it has an 1/8-inch audio jack that can drive a pair of stereo speakers. Users can stream music to the range extender directly from their smartphone, tablet, or PC. A 100Mbps ethernet jack enables the RE4100W to also act as a wireless bridge for devices that require hardwired ethernet connections. The Linksys RE6700 range extender is based on 802.11ac technology, and Linksys says it can increase the range of an existing wireless router by up to 10,000 square feet. It also plugs directly into an AC power outlet, but it includes an electrical pass-through so you don't lose an outlet. Despite its small size, the RE6700 includes a four-port gigabit ethernet switch as well as an 1/8-inch audio jack to support powered speakers. The Linksys RE4100W will be available soon at a price of $80. The Linksys RE6700 will be available in April at a price of $120. Finally, Linksys announced that an upcoming release of the Smart Wi-Fi firmware for its Linksys EA- and WRT-series routers will add a number of new features, including an OpenVPN server, a Wi-Fi schedulers, a new network map, and improved device identification. Linksys is playing catch-up with other high-end router manufacturers in this area, so these are welcome improvements. The new firmware is scheduled to roll out sometime in the first quarter.